The thought-expanding encounter was led by former Principia College political science professor Libby Hoffman, founder of Catalyst for Peace. A nonprofit organization based in Portland, Maine, Catalyst for Peace has worked closely for several years with Fambul Tok, a community organization in the West African nation of Sierra Leone working to address the legacy of the brutal 1991–2002 civil war. The two organizations have documented this local, grassroots peacebuilding process in the documentary Fambul Tok (“family talk” in the local Krio language). The Upper School Student Council urged hosting Hoffman in its effort to increase student awareness of global issues. The movie was shown in Ridgway on February 26, and the following day, Hoffman facilitated a (required) talk with all Upper School students, using a slideshow and excerpts from the film to spark discussion. Hoffman started off by asking students what justice typically looks like in the American context. The answers included trial, establishing guilt, correcting actions, punishing a crime, and pardon. Hoffman then raised the idea of justice without retribution or punishment, but with an emphasis on forgiveness, reconciliation, and reconstruction—all within a broader community context and not just between the individuals involved in a particular case. “Even though this is happening in a country so far away, I felt we could all relate to these ideas,” remarked one student. Both the presentation and film movingly depicted the healing power of this traditional Sierra Leonean approach to truth-telling and forgiveness involving both victims and perpetrators. 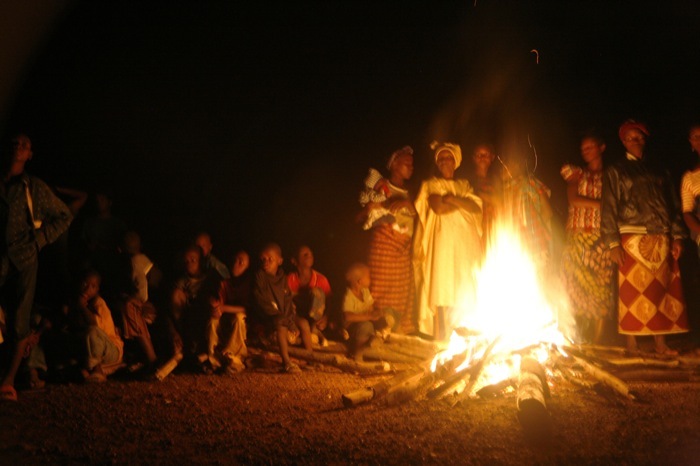 Through this practice of “family talk” around a communal bonfire, villages, one by one, are building sustainable peace at the grassroots level. The lesson? That effective justice based on individual healing and forgiveness helps build strong communities that give both victims and perpetrators a new lease on life.